Riverland locals may notice a steady increase to the Murray’s water levels from 15 August, with weir pool raising starting to help improve the health of the river and its ecosystems. 0.35 metres and 0.50 metres respectively above normal pool level by early September, until mid-October. Water levels will be returned to normal by mid- November. Department for Environment and Water (DEW) River Murray Operations Manager Jarrod Eaton said deliberately raising water levels along the River Murray partially mimics the natural seasonal wetting of the river’s wetlands and floodplains that occurred before the river was regulated. "The manipulation stimulates growth and breeding in food chains, with particular benefit to small native fish species, which in turn provide food for larger native fish species and also help to increase the diversity of vegetation,” Mr Eaton said. Water for the weir pool raising is being provided by the Commonwealth Environmental Water Holder. 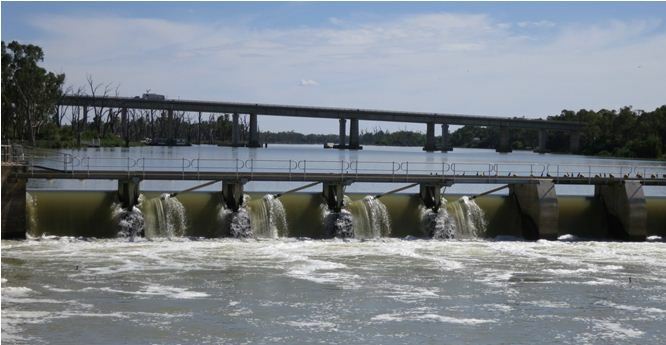 The water level in Lock Five is currently 0.1 metres above normal pool level and Lock Two will be raised over the next fortnight to 0.15 metres above normal pool level. For further information on weir pool manipulation visit the DEW website.